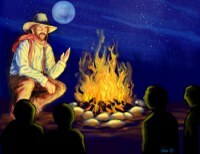 Join David Owens, park interpreter and Cowboy Poet, at the Lone Star Amphitheater for a fun evening of cowboy poetry and stories. Experience cowboy lifestyle and local history through the poetry and stories of the Texas cowboy. Held at the Lone Star Amphitheater in Lake Mineral Wells State Park, 100 Park Road 71, Mineral Wells, TX, 76067. Accessible for the mobility impaired. The program is free with paid park entrance fee or a State Park Pass.